This document is for HP and Compaq notebook computers with Windows 10 or Windows 8. Follow the steps in this document to resolve an issue with the screen remaining blank after the computer is turned on. If the computer does not turn on (no lights or sounds) or the screen displays an error message, see HP Guided Solution – No Power or No Boot Troubleshooting or Computer Does Not Start (Windows 8). If the blank screen occurs after you enter your password and there is a blinking cursor on the screen, see Black or Blank Screen with Blinking Cursor after Entering Windows Password. After updating to Windows 10 RS2 you might encounter a black screen with a static, or non-blinking, cursor when starting the computer. The computer might stay in this condition for five minutes, or up to 15 or 20 minutes. Use the following instructions to resolve this and start Windows normally. Wait 15 to 20 minutes, if necessary, for the boot process to complete and the Windows desktop to load. Download and install HP Image Enhancement for System Logon. Restart the computer after completing installation of the SoftPaq. In the search field, type Services. In the search results, click Services Desktop app. 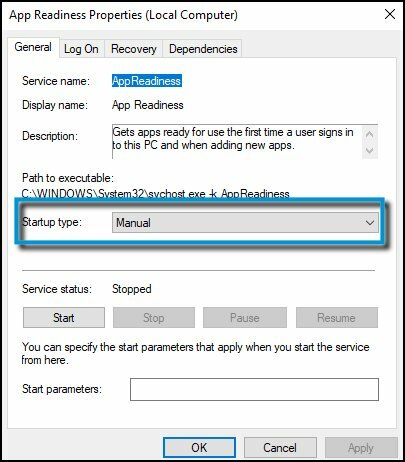 On the App Readiness properties page, in the General tab, set the Startup type to Manual. Restart the PC after completing installation of the SoftPaq. Resetting the computer can resolve many issues that cause a blank screen. Use the steps in Performing a Hard Reset or Forced Reset to reset your notebook. If the issue is not resolved by performing a hard reset, proceed to the next troubleshooting step. The notebook screen display might remain black when there is a corrupted graphics driver or a problem with the LCD display back light. To test the display, attach an external monitor and restart the computer. Testing with an external display is helpful if the notebook display is black but you can hear sounds; such as fans, spinning drives, or beep tones that indicate the computer is operating. Connect an external monitor to the notebook. For instructions on connecting an external monitor, see Connecting a Monitor, Projector, or TV (Windows 10, 8). If the computer screen does not automatically display on the external monitor, press F4 (or the key with this symbol ) until the screen image displays. If an image displays on the external monitor, there might be a graphics driver conflict with the notebook LCD display. With the external monitor connected, go to the HP Customer Support – Software and Driver Downloads page to download and install the latest graphics and chipset drivers for your specific computer. If there is an updated BIOS version available, use the steps in Updating the BIOS to install it. If you have updated the chipset and graphics drivers and BIOS, but the notebook display still remains black, the LCD might be defective. Contact HP for technical assistance or send the notebook for service. If you can hear sounds of operation but no image is visible on either display, proceed to the next troubleshooting step. When you upgrade the BIOS on your notebook, a copy of the previous BIOS version is stored in the HP_TOOLS partition of your hard drive. Many HP notebook computers have an emergency BIOS recovery feature that allows you to recover and install the last known good version of the BIOS from the hard drive, as long as the hard drive remains functional. This emergency recovery feature is separate from the BIOS and is designed to work in the event of a catastrophic BIOS failure. Connect the notebook to a power source using the power adapter. Press and hold the Windows key and the B key at the same time while the computer is off. While still pressing the Windows key and the B key, hold down the Power button on the notebook for one second, and then release the Powerbutton and the keys. The power LED light remains on, and the screen remains blank for about 40 seconds. You might hear beeping sounds. Eventually, an HP BIOS Update screen displays, and the BIOS update begins automatically. If recovering the BIOS did not resolve the blank screen problem, proceed to the next troubleshooting step. A computer might not display an image if a memory module is loose. Reseating the memory modules might resolve blank screen issues. To reseat the memory module, follow the steps in this section to remove the memory module from the memory slot, and then put it back into the slot to get a better connection so that the computer can recognize the memory. These steps work for most notebook computers. To find steps for your specific computer, enter your computer model number and replace memory into the search field at the top of this window. For example, if you have an HP Mini 210-3000, you would search for 210-3000 replace memory. If you cannot find a memory replacement procedure for your computer module, review the User Guide. For further information, see HP Notebook PCs – Upgrading Memory (RAM). Remove the AC adapter (electrical power) from the notebook. Turn off the computer by pressing and holding down the Power button for 30 seconds. Unplug the AC adapter from the notebook. Use your finger to lift the battery up and out. Remove the memory module cover on the bottom of the notebook. Remove the memory modules from the memory slots. To prevent damage to the memory module, grasp the memory module by the side edges. Do not touch the metal contacts. Reseat the memory module by holding the module at a 45-degree angle, and pressing it firmly into the memory slot until it is firmly seated. Replace the cover over the memory compartment. When troubleshooting problems, use only the AC power to perform the tests. After the problem is resolved, you can turn off the computer and insert the battery into the notebook. Plug the connection from the AC adapter into the notebook, and then connect the AC adapter to a working power supply. Perform any tests to verify the computer can start up and run Windows. With the computer turned off, push the battery into the base enclosure until the retention clips click into position. If the computer fails to boot to the Windows desktop, no LEDs light up and no beeps emit from the computer, contact HP for support. If the computer fails to boot but there are LED lights or beeps, proceed to the next step. LED lights can indicate a variety of error conditions. If your computer makes one or two short beeps before starting, this is normal and your computer is telling you that BIOS startup was successful. If your computer beeps and does not start, a more serious hardware issue is likely occurring. If the previous steps did not resolve the issue, refer to HP Guided Solution – No Power or No Boot Troubleshooting to help identify the beep codes or LED light patterns.